Finally, don’t forget that in the time it takes this soup to cook you can easily bake a homemade bread. This week I’ve been baking this easy little oat bread, but a whole wheat soda bread or even a beer bread would be perfectly nice as well. Simple Lentil Soup: Finely chop 1 onion, 2 carrots, and 3 garlic cloves. Cook in olive oil over medium heat (covered but stirring occasionally) until softened, about 25 minutes. Add 7 c. vegetable broth, 1 tsp. dried thyme, 1/4 tsp. celery seeds, 2 bay leaves, a few grinds of pepper, 1 1/2 cups brown lentils, and a can of diced tomatoes, and bring to a boil. Reduce heat, add that Parmesan rind, and simmer until the lentils are very soft, about 40 minutes. Near the end of the cooking time, add salt to taste (start with 1/4-1/2 tsp; how much you want will depend on how salty your broth was to begin with). Blend until smooth, or leave some of the soup un-blended to add texture. Optional: top with grated Parmesan cheese. Or a swirl of olive oil. Or a spoonful of yogurt. Or sauteed greens. You can’t go wrong. This sounds great! I’ve had a few recipes that call for a parmesan rind and whenever I ask a grocer they look at me like I peed my pants. Where do you get yours fellow seattleite? That’s great! I’m going to check out my Whole Foods on my next trip for that. Thanks everyone! What a delicious soup! I didn’t know you could use the rind for this, that a great idea! Fantastic. I think Parmesan rinds are almost always great in lentil and white bean soups (and also vegetable stock, of course!). Hehe, I make and love soup year round, goldangit! Be proud! Lovely! Huge lentil fan and (once again we are on the same wavelength) just finished a lentil post for later in the week. Oh, good! I love lentils and I am always looking for new ways to enjoy them! I’m looking forward to seeing your post. I love the simplicity of your lentil soup! I make a Morroccan lentil soup but it has like 20 ingredients. Pre-Vegan days I used to always put parmesan rinds in soups to deliciousify them! I am going to try yours but make it vegan by subbing out nutritional yeast for the parmesan rind. I think it will be amazing! I will let you know. We eat soup all year. I love it. When it’s hot outside, I will often just eat the leftovers cold. Ok, going back through your posts is causing serious drooling. Dangerous as I haven’t had breakfast yet! Here is the deal with nutritional yeast: when I went plant based, I did it cold turkey. I bought nutritional yeast because all my new vegan cookbooks said it tasted like cheese. It. did. not….. that is, until I hadn’t eaten cheese for a month or so. Now I absolutely adore it and use it in every recipe that could be spruced up by a little cheesiness. I would start small. Add a tablespoon or a time to recipes where you would normally use cheese. Let it grow on you until you love it dearly, then start using copious amounts. I substitutes it for cheese all the time, but sometimes it needs a medium, like tofu or cashew cream to really replace cheese in a recipe, like on pizza or in enchiladas. Adding garlic and salt helps too. My friend who lives 12 hours away called me last night while making the Mexican Mountain. She was about to add active dry yeast to the recipe. Hilarious. One last sorta recipe: The house dressing by Chef AJ with nutritional yeast is a dressing I cannot live without. Seriously drink it right out of the jar. Here is the youtube demo with recipe. She is AMAZING. Looks so good! I love soup year round too (we are in the same part of the world – so wet here this week!) – and your classic recipe looks perfect! I can’t wait to try this one! Oh, yes, I freeze it all the time. No problem. Just put a splash of water in the pot with the frozen soup when you warm it up so the lentils don’t stick at first. Cool! I’ll be making some of this soon then! I love lentil soups. Whole Foods sells Parmesan rinds next to the pre-grated cheese. I’ve never bought them because I have more than enough at home in my freezer. I seem to accumulate more rinds than I can use up though, so the bag is a little bit like an archeological dig: really freezer-burned ones on the bottom, fresher ones on the top! Thanks for the tip! Your Parmesan rind situation sounds a little like my own–I cleaned out my freezer lately and was pretty impressed with how many I had squirreled away. I have been using them quite freely ever since! This looks so good. 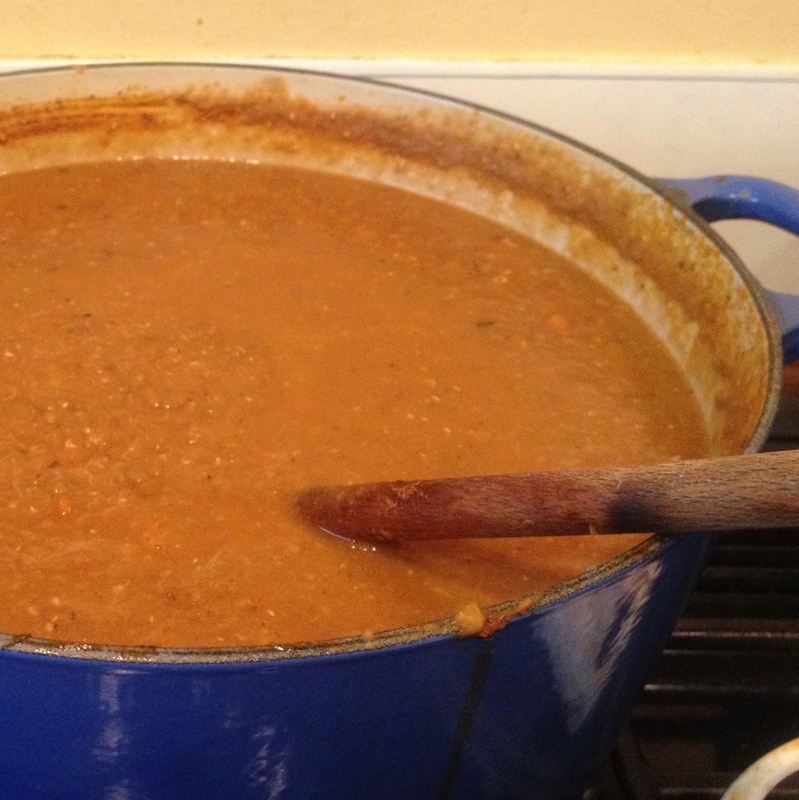 To me there is nothing quite like lentil soup to satisfy. Agreed, I love lentil soup. I could eat it every day. And sometimes I do! I love using cheese rind in soup. And with lentils…yum, yum, yum! Love, love, love lentils, especially in soup. I always throw a cheese rind in my soup too, if I have it! Can you get local lentils where you are? 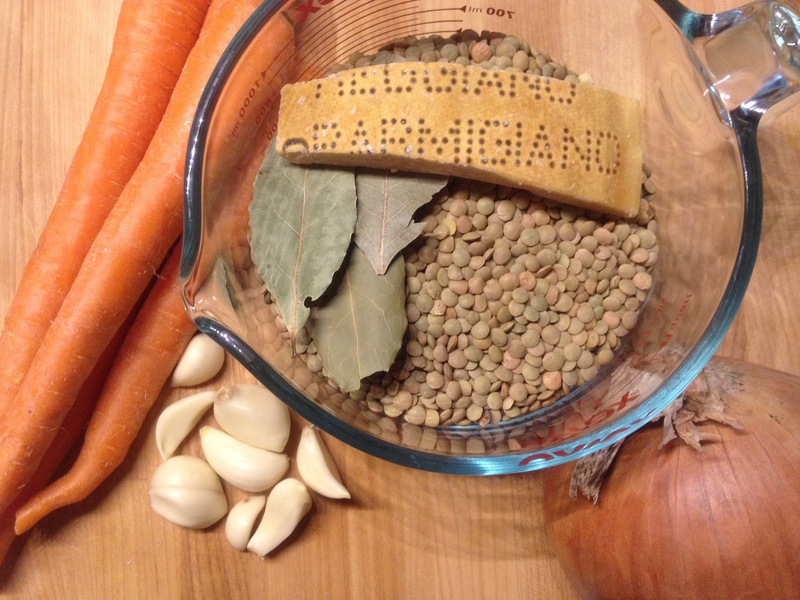 I can get dried beans at my farmers market but have never seen lentils–I should ask around! I have a meeting with a local shop owner on Wednesday. I’m going to pick her brain about all my local options for beans, flour, etc. I’m not sure if lentils are grown in the Mid-Atlantic states! Thanks for this great recipe! I was looking for a simple lentil soup recipe, and this fit the bill exactly. The parmesan rind gave the soup a really nice flavor. This recipe is a keeper.